Matthew's newest obsession is salt Cured Egg Yolk! So much so that lately our fridge is full of plates and bowls of salt and egg yolks leaving me no room to store any of our other food. If you don't believe me check out the video below of Matt showing you exactly how to make them. His excitement says it all! And, if I'm being a little honest, these are incredibly impressive and delicious. They are worth trying at least once. Time after time we find ourselves making recipes where only the egg whites are needed, such as in our Low Carb Tortill﻿a recipe. We often get emails asking us what can be done with all the leftovers yolks, and we have just the answer for you. Cure them! Not only is it something you've likely never tried or thought to do, but the flavorful outcome makes it worth all the time you invest in making them! We now like to have at least three or four on hand to give a flavor boost to some of our meals. To be honest, the only way we've used our cured egg yolks thus far has been thinly sliced on salads, and it seems like it doesn't get much better. The yolks not only make all the other flavors in your salad pop, but add a nice little salty bite! However, the yolks would definitely be a great garnish grated on top of pastas, meats, veggies, you name it! The cooking process makes it soft enough to thinly slice, but hard enough to grate with a cheese grater. If you are looking for recipes to add the cured egg yolks to you should make our Fat Bomb Pasta! The simple, creamy Alfredo sauce would come to life even more with some cured egg yolk grated and mixed in. We've provided you the instructions to make a salt cured egg yolk below, however, you can get a little wild and make erythritol cured egg yolks too! 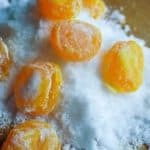 Recipe can be quickly added to MyFitnessPal - Search "KetoConnect - Cured Egg Yolk"
Make a thick layer of salt on a large plate. Using a spoon, make six dips in the salt where you will gently place the yolks. Make sure there is still a layer of salt at the bottom of the dip (yolk should not touch the plate). Crack each egg discarding the white and gently placing the yolk into each of the six dips in the salt. Layer the salt over all the yolks, submerging them entirely. Place in fridge for 48 hours. After 48 hours, remove the yolks from the salt (they should be solid at this point) and place on a baking rack. Bake in a 150 degree Fahrenheit oven (or the lowest your oven will go) for 2 hours. Remove after 2 hours, allow to cool and store in fridge.